I am really trying to carpe March’s diem over here. We had a rough start to 2011, but when March 1st came along I declared war on all the crap being thrown our way. We have been in a down season. It happens to everyone. So why not an up season? Lucky for me, the weather is also taking this positive approach and showering us with lots of sunshine and the occasional much needed rain. 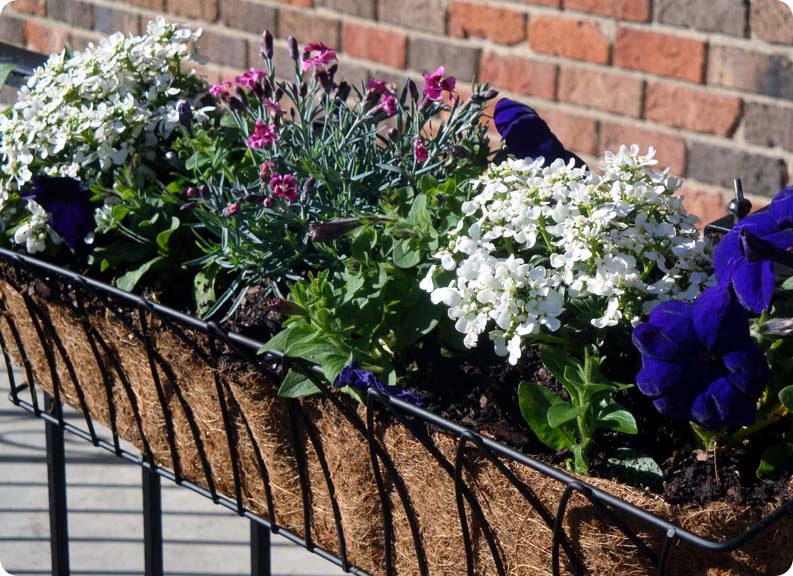 It seems like the perfect time to start flower boxes! I’ve been inspired by my friend Paige over at Love Sown lately so we got to work. In years past we have enjoyed square foot vegetable gardening. While that was really fun at the time, this year we are in a new house and with a baby on the way we’re taking it easy. We don’t yet have any front porch furniture because we’ve never had a front porch! 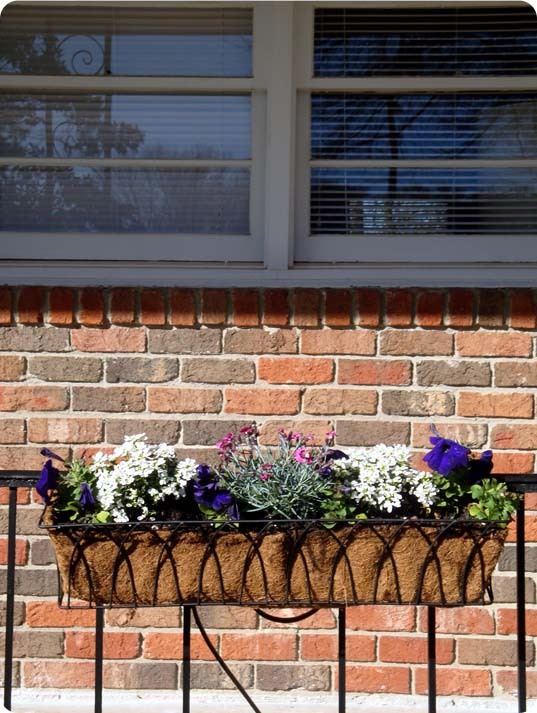 So we thought flower boxes would be a nice way to get the ball rolling and make the house look like more of a home. Oscar and I ventured out to Lowes to get all of our supplies. We chose Peppermint Star Dianthus, Snow Cone Candytuft and Petunias. They are all fairly resilient, can tolerate full sun and don’t need to be soaked all the time. And they’re pretty! We spent the afternoon getting filthy and it was so much fun! In fact, I had planned to take a few pictures and completely forgot. I love it when that happens. There is just something so soothing about getting your hands dirty. And while I had only planned on the 3 flower boxes for the year, now that they are done I am sure I will want to do more! Maybe just a couple container gardens…. Yeah, just a tomato plant. Maybe some peppers? Ooh, and a cucumber? 😉 I am attempting to get the garden going this year before the babe gets here. Hopefully we’ll have tons to share with y’all!! Holla! The flower boxes look great! I love the cool hues. I’ve been snatching up flower seed myself and finally got impatient enough to buy some flowers yesterday afternoon. Those are gorgeous! 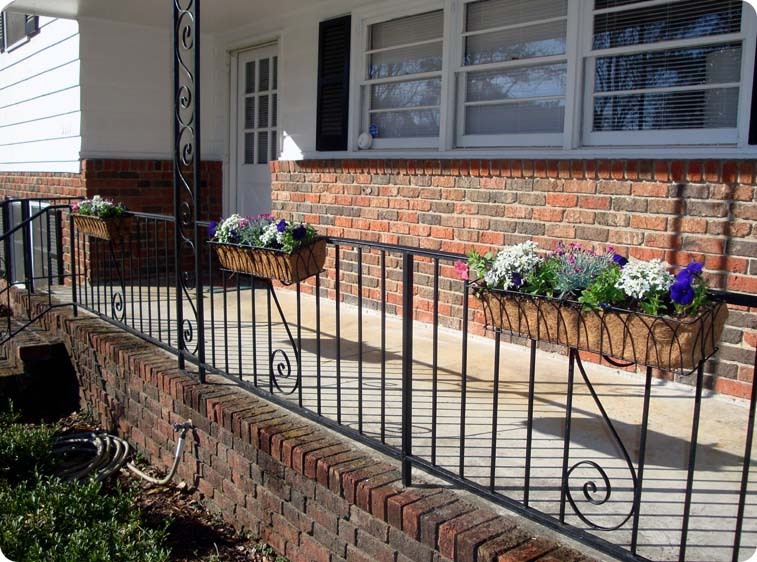 It’s almost time for us to start planting a few flowers in the pots out front. Still too cold, though. They look so awesome! Every year I proclaim that we’re going to do something nice in the yard. I hope I can do it this year! I’m scared it’s still a little too early for new plants here. It’s still cold at night. I can’t wait to garden, though. Those look great! Those are absolutely amazing! I love them!! So pretty! I love to plant flowers, if only I could remember to water them through the hot summer days. Beautiful! We have those same flower beds on our backyard fence. Love them! I’ve always wanted flower boxes, but I have such a black thumb all of that money spent would be a huge waste of money. Someday maybe I’ll have the money to hire someone, but until then I’ll just oggle yours. Tomorrow (March 12) is Plant a Flower Day, so I’ll be starting my sweet peas. Can’t wait to breathe in that fresh dirt smell and get my hands filthy! A beautiful start! The flowers look great in those flower boxes.